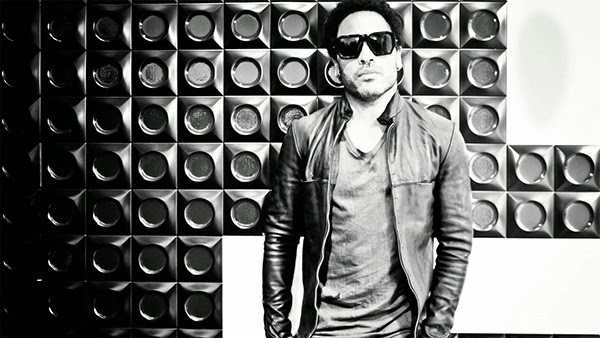 You may know Lenny Kravitz as a legendary rock n’ roller, but he’s also an awesome designer, too! 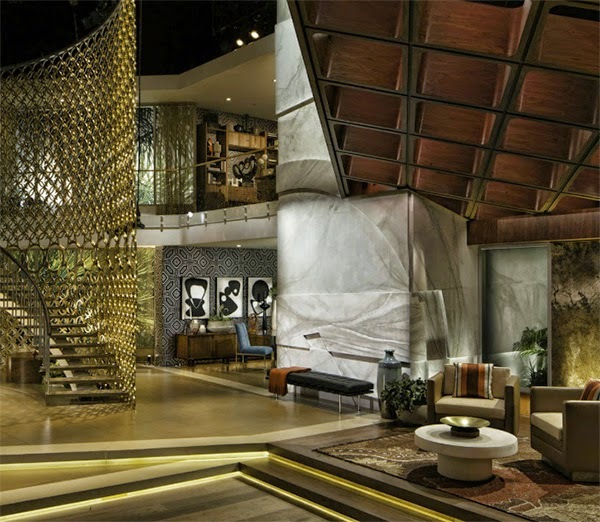 Lenny Kravitz is a premier residential and commerical designer and founder of Kravitz Design, which has been creating beautiful and dramatic interior designs since 2003. I’ve found that many of the best artists have talents in multiple art forms and this is certainly true for Lenny Kravitz. Here’s a look at the unique designs of Lenny Kravitz. This dramatic black and white living room, below, features one of Kravitz’s favorite furniture items, Ligne Roset’s “Togo” sofa. Kravitz told Elle Decor that the Togo sofa was one of his top 9 must-have items. He has this sofa in each of his homes, he says, simply because it’s “timeless, organic, and supercomfortable.” Take a look at how he designed around the unique and comfy sofa in his Paris home below. 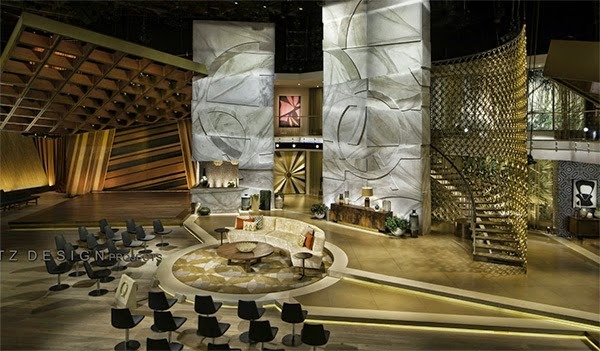 Kravitz Design also designed the set for The Queen Latifah Show! (shown above and below.) I love the dramatic, metal cut-out wall featured along the staircase. Kravitz always gives you a punch of art and luxury in each design. You’ll notice this in the next designs featured below, as well. 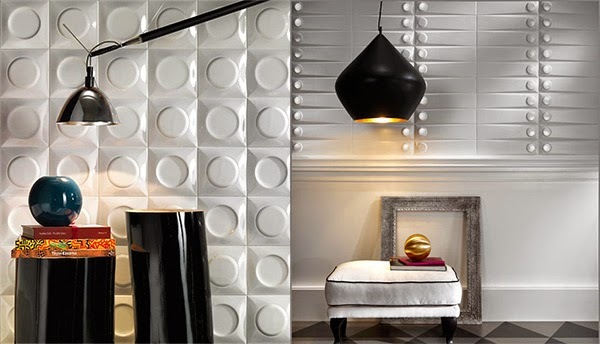 Lenny Kravitz has recently teamed up with Lea Ceramiche to create a contemporary tile collection featuring their interpretation on tri-dimensional decor. Kravitz also designs furniture, but of course! He really is an all around artist. I have featured one of the chair collections he collaborated on later in this post. Kravitz’s glazed ceramic tiles for Lea Ceramiche, Images via Prete-a-Reporter, Hollywood Reporter and Cerami Inc. 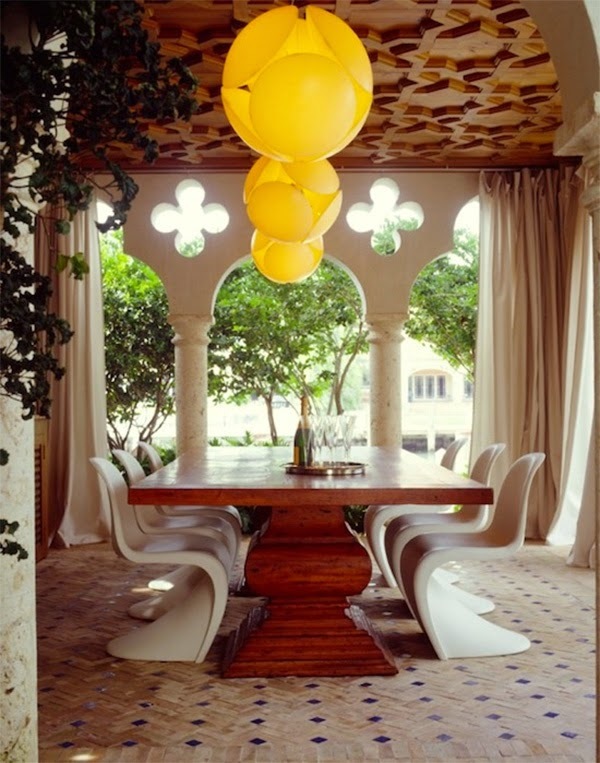 The chairs, shown above, are the product of the collaboration between Lenny Kravitz and French designer Philippe Starck. They worked together to re-imagine the “Mademoiselle” chair of Italian furniture company, Kartell. Kravitz brought his rock n’ roll approach to the design and reupholstered this chair in edgy materials like python and fur. If you like these chairs and want to add a little rock n’ roll to your home, they are currently available at Hive. These are two of my favorite Lenny Kravtiz designs (above, below). I really enjoy the mix of the bright, contemporary white furniture with the more organic wood beamed, ceiling and ethereal, cloud like quality of the lighting (above). 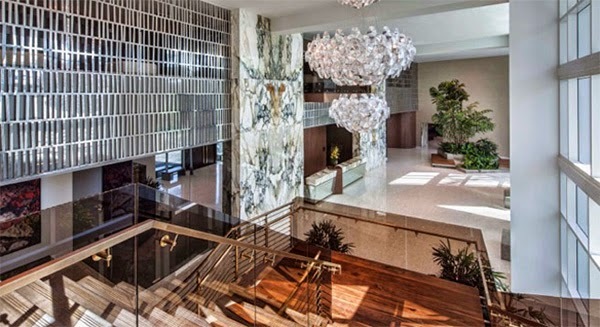 And as you know, I love when sculpture art is included in residential design. Such an artful touch! Below, all of the patterns presented make for a unique and visually interesting dining space. From the chevron flooring to the patterned ceiling and sunny yellow chandeliers, this room is delightfully memorable. So, if you thought Lenny Kravitz was talented before, I’m sure you’re really impressed now! He is an artist by all standards. 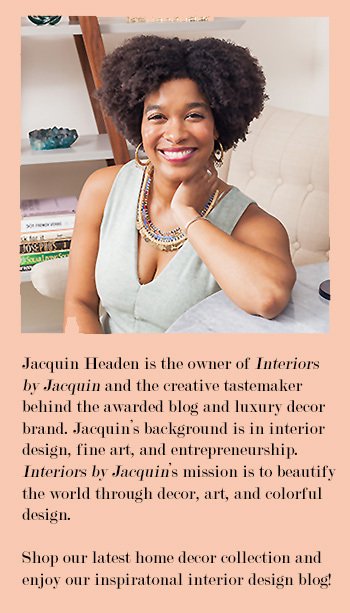 I’m looking forward to seeing what Kravitz Design does next! What do you think of his design work?